Replaces single (#9013741) and Dual (#9013742) or (HACC-9294)throw away sealed battery wand and enables users to simply replace batteries. 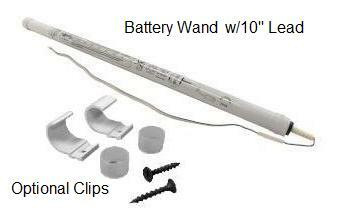 See 'In-Line' or 'Side-by-Side' Dual Reloadable Battery Tube Kits on this site. Use of 'AA' Lithium Batteries recommended since they will not leak or corrode in higher heat areas near the window and ruin the battery wand. Use of rechargable batteries not recommended.